Bored of having the same breakfast every day? 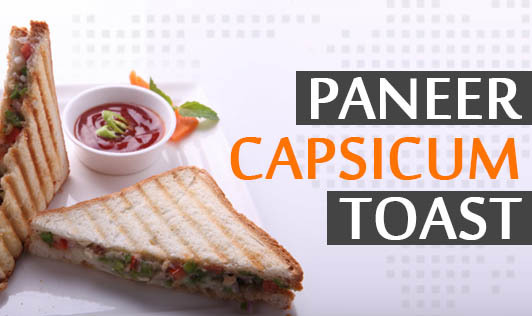 Try this easy to prepare recipe with paneer, crisp capsicum, onions and tangy tomato sauce. 1. Stamp out rounds from the bread slices with a 1 1/2" diameter cutter. 2. In every alternate round, make a hole in the centre with a 1/2" nozzle. 3. On a greased baking tin, first arrange all the bread rounds without holes and then place the rounds with holes on top. 4. Brush the tops with melted butter and bake in a hot oven at 200°c for 10 minutes or until crisp. Keep aside. 5. Heat the butter in a broad non-stick pan, add the onions and saute on a medium flame for 1 minute. 6. Add the capsicum and saute for 1 minute. 7. Remove from the heat. Add the paneer, tomato ketchup, chilli sauce, chilli powder and salt and mix well. 8. Spread a little of the filling on each uncut bread round and put back the cut round on top. 9. Sprinkle the cheese on top and bake in a hot oven at 200°c (400°f) for 10 minutes.